Recorded during Neil Young’s November 1976 solo tour, Songs for Judy features twenty-three tracks selected from a span of different concert dates. This warm, inviting collection includes classics like “Heart of Gold” and “A Man Needs a Maid,” plus one previously unreleased song, “No One Seems to Know.” The urgency of Young’s lyrics and the intimacy of his performance haven’t been toned down at all, despite the years. There’s lots to connect with on an emotional and artistic level. 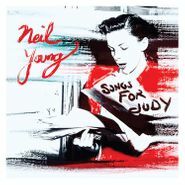 Songs for Judy showcases one of America’s most legendary artists, at his charming, thoughtful best.